I made this last night for myself and just halved the recipe. (In honor of the first day of Lent and my tradition of eating only eggs for protein that day.) So good and I baked it in the toaster oven in one of my low-sided soup/cereal bowls that is oven safe. Very good - I'll be making this again. Preheat oven or toaster oven to 400F/200C. Spray 2 individual baking dishes or a flat casserole dish with non-stick spray. Wash mushrooms and spin dry or dry with paper towels. Slice mushrooms into slices about 1/2 inch thick. Heat oil in a large frying pan over high heat and saute mushrooms until they have released all their liquid and the liquid has evaporated, about 6-8 minutes. Season mushrooms with a little salt and fresh ground black pepper and quickly transfer to baking dishes. 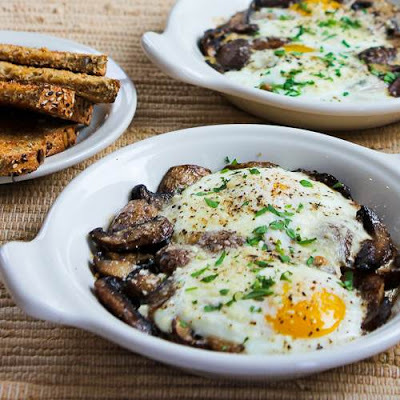 Break two eggs over the mushrooms in each individual dish (or four eggs over all the mushrooms in a casserole dish.) If you're not that experienced at breaking eggs, you can break each one into a small bowl and then gently pour it over the mushrooms. (If you don't mind dirtying extra dishes, it would be nice to have each egg broken into a small dish so you can put them over the mushrooms as quickly as possible.) Season eggs with a little salt and fresh ground black pepper to taste and sprinkle a little Parmesan over them. Bake eggs until they are done to your liking, about 10 minutes for firm whites and partly-soft yolks. If you want toast, make it while the eggs are baking. Serve hot, with toast if desired.